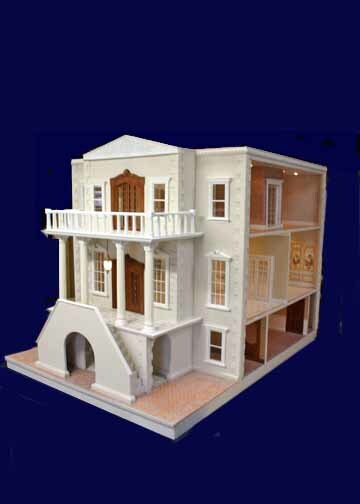 “The Palmetto” an “Italianate” mansion, 7 large rms., 161/2″W x 29″L x 31″H, milled siding. Thank you for the nice comment! I have been building quality dollhouses for the past 25 years and still loving it. The dollhouse hobby is making a strong comeback and more and more young families with children are returning to this family hobby. It is so nice to sit and talk with your children while “Building”, “Designing”, and “Decorating”, the family dollhouse, that someday will be passed down to the next generation. Wow! These are just amazing. It would be really helpful to have pictures of the inside, so we could see the layouts of each one, plus a basic price range. I have loved dollhouses since my dad made me my first one when I was three. You are an incredible craftsperson. Thank you for the nice comment and your suggestion. 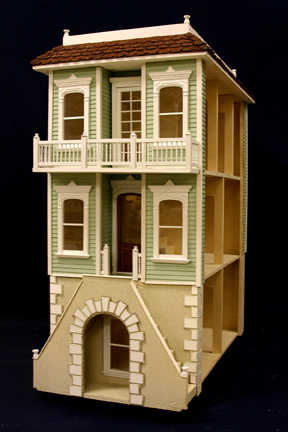 I have been building quality custom dollhouses for over 26 years and still enjoy the work. Lately I have been getting custom dollhouse orders from all over the USA, and have very little time to devote to adding more details to my web site, but thank you for pointing that out and I will work on that. If there are any dollhouses that you are interested in, please let me know and I will get more pictures and details back to you. Email is dollhousemansions@gmail.com and cell is 203 768-3816.